Injured Marine holds salute for 3 hours. 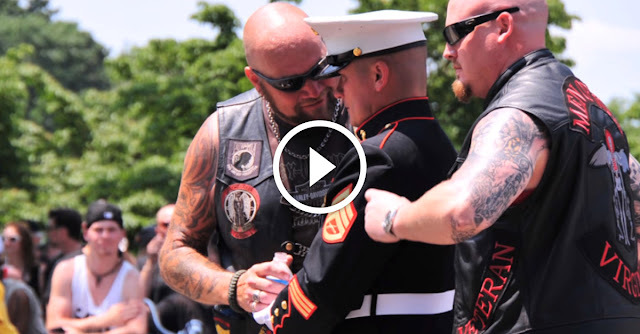 Then some patriotic bikers show up..
It’s during the Rolling Thunder Ride for Freedom when Marine Staff Sergeant Tim Chambers pays tribute to his fallen brothers in arms. Because of this moving tribute, he has become a local hero. Over a 3 hour long salute over the makeshift memorial takes place. Tim holds his salute in place this whole time, despite an injured wrist which should have been placed in a cast due to the nature of the injury. It’s simply not going to stop Chambers from respecting and saluting the men and women who gave their lives. This is one hell of a tribute video and watching it gives it the attention it deserves, and remembers those who have given their all for this country. Share with friends and family.